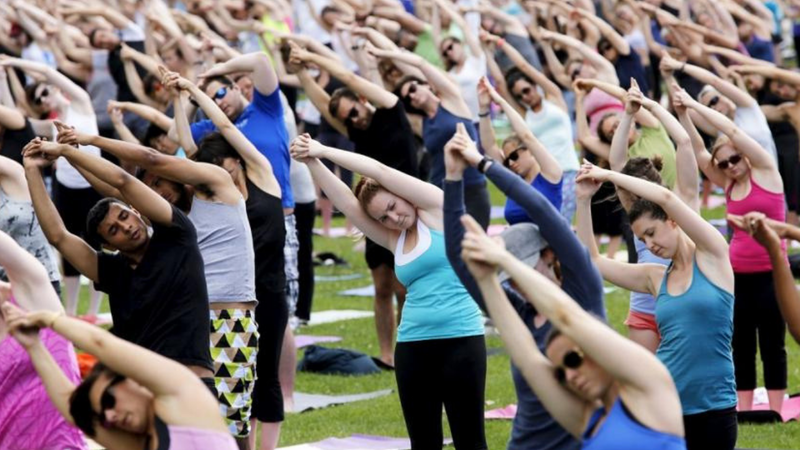 ‘Be an Outsider at Work’ is designed to eliminate the barrier that separates work from nature. 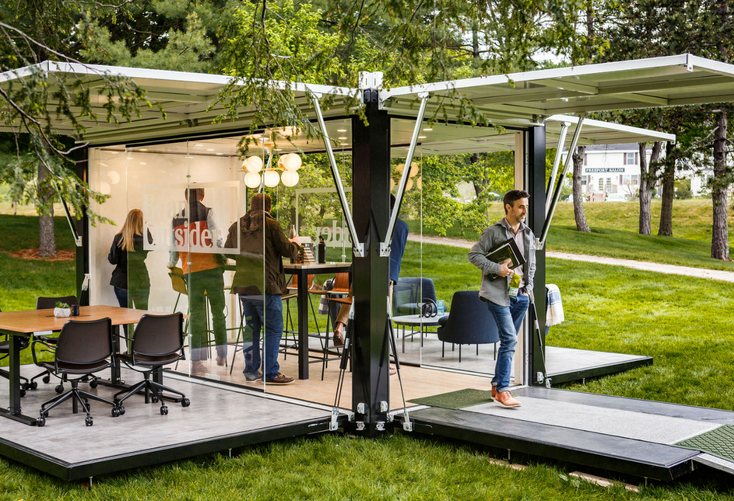 Designed to eliminate the barrier that separates work from nature, ‘Be an Outsider at Work’ is a mobile pop-up workspace that is currently touring the U.S. The benefits of nature on our wellbeing and health are extensive, and designers now encourage workspace operators to bring the outdoors in. L.L. Bean’s approach takes this concept several steps further, creating a space that eliminates the barrier that separates work from nature. 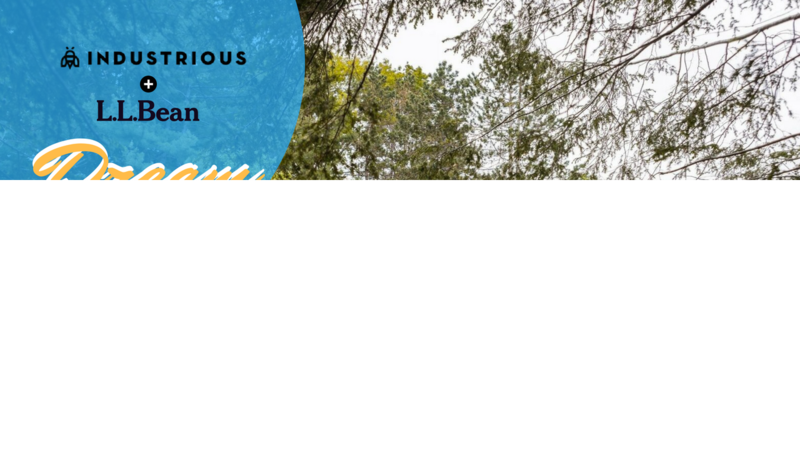 In a phone interview with Jamie Hodari, CEO of Industrious, Allwork.Space learned more about “Be an Outsider at Work” and what the high-end coworking brand has been up to recently. Allwork.Space: Tell me about the L.L. 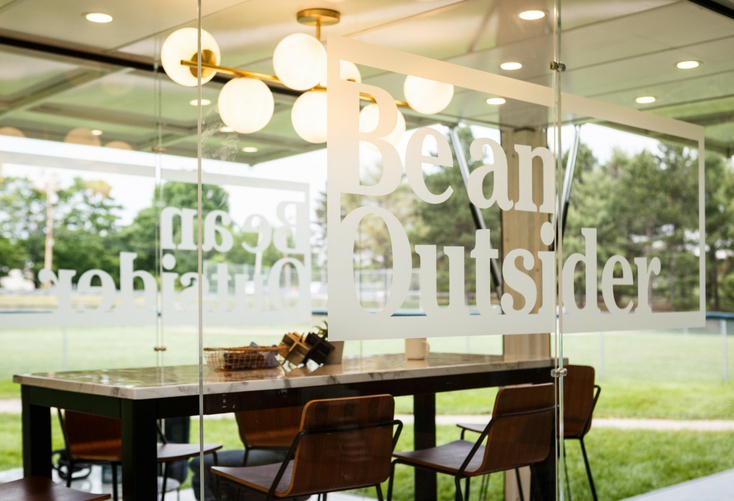 Bean partnership and the outdoor coworking project. Jamie Hodari: L.L. Bean approached us about five months ago. From the start we thought what they proposed was a cool idea. The project itself was something we’ve never tackled before and it was a learning experience for us to figure out with L.L. Bean what we wanted the project to look and feel like. For us specifically it was an interesting project as it allowed and encouraged us to be creative; we had to create a space that would include what L.L. Bean needed, but that would also be fun and exciting for people to use for a couple of hours. For us the project was also an opportunity to think about whether or not this outdoor coworking concept could potentially be a product that we could develop; it got us thinking of whether this is a concept that would be useful for cities, corporate campuses, and the like. Allwork.Space: So, is it a product that you will eventually develop? To be honest with you, we still don’t have the answer. We will have to wait and see how people respond to the idea with the space we created for L.L. Bean. Allwork.Space: You mentioned that “Be an Outsider at Work” seemed like a cool idea. What else drove you to take on the project? Part curiosity. But mostly because L.L. Bean is a high-quality brand that’s a really good fit with Industrious’ customer base. We thought it was a nice brand alignment. We also shared a common goal with L.L. Bean. At Industrious we are trying to make a point about what makes people productive and engaged in the workspace. Being outdoors helps, and L.L. Bean’s survey confirmed that. At Industrious we’ve always centered on creating spaces that improve productivity, that make people love being at work. We like to think about the small things that help drive productivity and feeling good at work; these are the projects we get excited about at Industrious and “Be an Outsider at Work” fits that vision perfectly. Allwork.Space: Is the partnership a management contract or are you just responsible for building and designing the space? We designed it and we are running it. 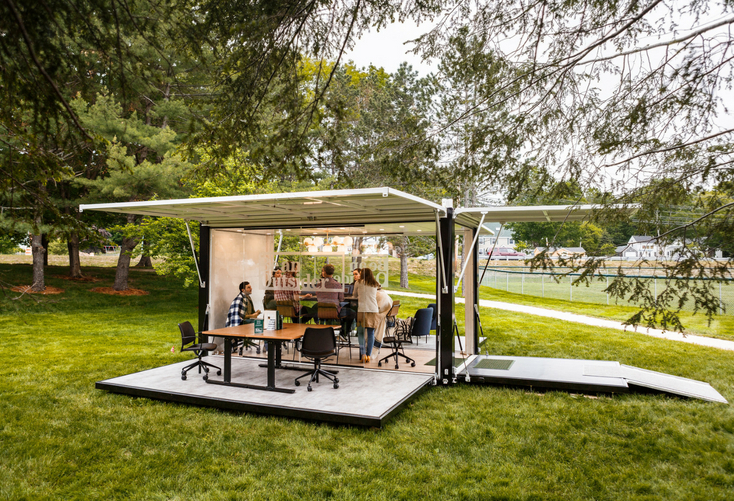 “Be an Outsider at Work” is a mobile outdoor coworking space and it’ll be basically touring the country, starting in New York City this week and then it’ll reach Boston, Philadelphia, and Madison. Allwork.Space: Will you be designing any new spaces like this one in the near future? For the time being we will stick with this one and move it around the country. The space can be rolled out or packed up in 30 minutes to an hour. Allwork.Space: I have to ask, is the space fully equipped? 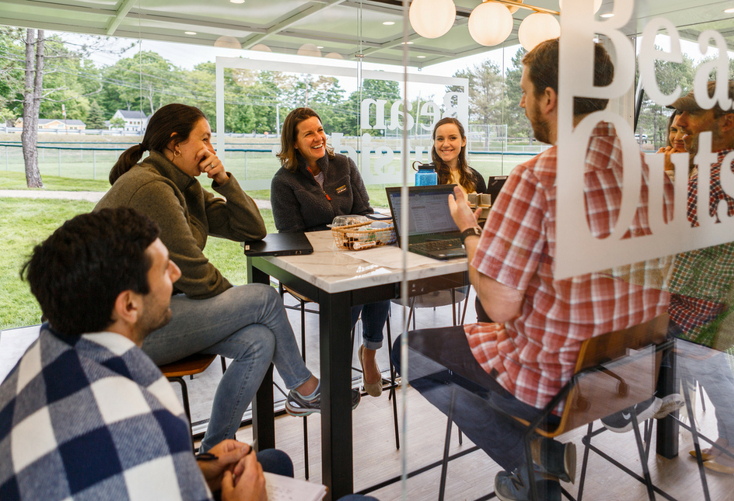 The space has a lot of soft seating areas, standing and seated conference rooms, stationary bike desks, shaded and sunny conference table, and a team building section. The space is equipped with wifi, however, it doesn’t have a kitchen or a bathroom. Allwork.Space: It’s pretty obvious that designing this space is unlike designing any other Industrious space. What were some of the biggest challenges? 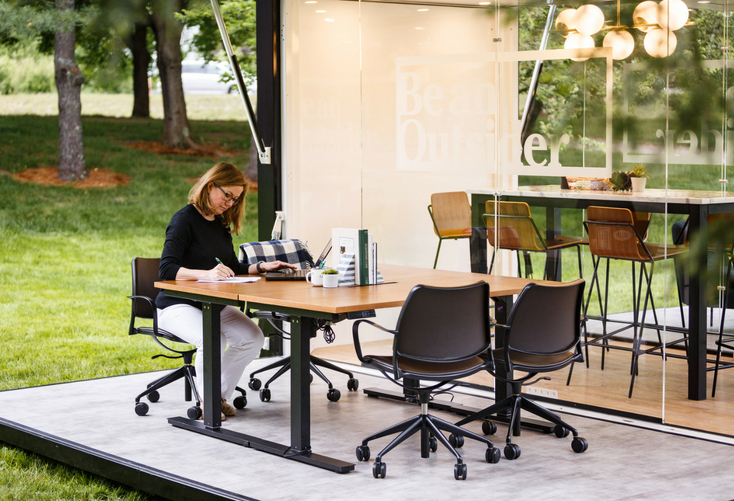 I would say the biggest challenge was that there is no such thing as outdoor office furniture, or at least no one that we knew of manufactures office furniture that is truly meant to be outdoors. There are some nice pieces for decks and terraces, but it’s not furniture that is built for productivity. Stephen Tortorella (designer, via email): This site presented a unique opportunity to express what makes our offices comfortable, welcoming, and productive, all juxtaposed against the outdoor environment. The challenges we faced in designing were, solving [the problem of] our materials and furnishings being outside and traveling from site to site. However, in general, the materials, furniture, and details that you see in the activation are what you’ll find in our office space too. We pushed to have our distinct brand shine through, and I think we were really excited for the almost 1:1 translation of ‘office’ to ‘outdoor’. Allwork.Space: New York and the other cities the space is visiting are known for having extreme weather. Oh, for now the space will only be touring during the Summer. Allwork.Space: That makes sense. Who can use the space and how much does it cost? The space is open to the public and it’s free. People just need to visit the Industrious website to reserve conference rooms. Allwork.Space: What’s the space’s capacity? The space can seat about 40 to 50 people. Allwork.Space: That’s a lot of people for a mobile space. Changing the subject a little bit, what have you been up to recently? I was actually at a conference today and it was amazing. It felt like everyone was there — landlords, property groups, investors, workspace operators — and that we were all in tune as to how we envision the industry moving forward: management contracts. Allwork.Space: This makes sense, especially after your recent partnership announcement with Blackstone. Anything else you’d like to add? A lot. As you know we are switching to management contracts; but there’s also more news to come on this particular topic in the coming months. We also just finished gathering up data about the suburban market, so we will be publishing those soon. Biophilic design can reduce stress and it can improve memory, creativity, and overall wellbeing. 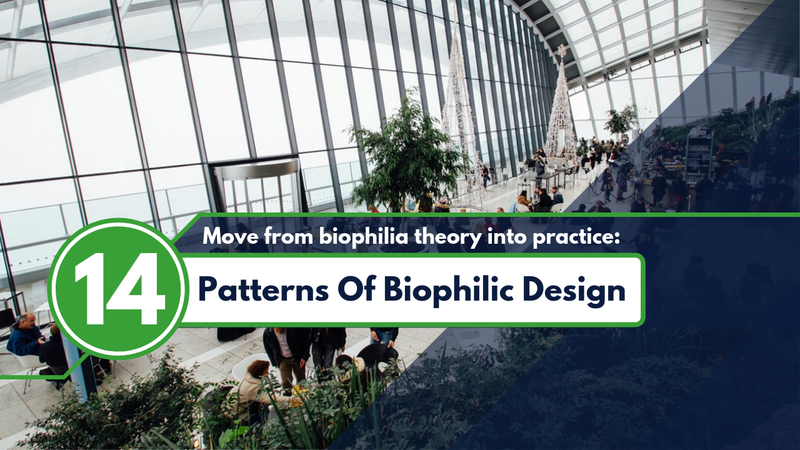 Here are 14 patterns to facilitate and inspire biophilia implementation.